Each week, Voice of Russia hosts Red Line, a discussion about the events of the week, as seen from Moscow. This week, events in Libya, AfPak, and the Dalai Lama. Ekaterina Kudashkina: This week we will obviously start with Japan, which is desperately struggling to overcome the aftermath of a devastating earthquake; then we will turn to the situation in Afghanistan and Pakistan, which is facing another dangerous turning point; and finally we will discuss the fate of Dalai Lama and the 52-year old movement for Tibetan independence. The Japanese earthquake and tsunami, which is one of the worst natural catastrophes in the modern history of Japan, is also having reverberations in Russia, and so we have chosen this topic for Beyond the Headlines. Mira Salganik: The situation in Japan evokes bitter feelings and bitter memories of the Chernobyl catastrophe, which was not so long ago. Ekaterina Kudashkina: This may be an inappropriate moment to recall it, but, frankly, relations between Tokyo and Moscow are not trouble-free. The notorious territorial dispute over the Kuril Islands is a chronic problem, but this is politics, and relations between people are something entirely different. Sergei Strokan: But on the other hand, just weeks before the quake, Moscow and Tokyo experienced a strong diplomatic shockwave over the Kuril Islands. It was followed by strongly worded statements and noisy protests by radicals tearing up national flags both in Tokyo and in Moscow. Mira Salganik: But things have changed dramatically. The tug-of-war of recent weeks has been overshadowed by this horrible disaster. Sergei Strokan: So you think it is a moment of truth for our relations? Mira Salganik: Up to a point. Of course, Russian Prime Minister Vladimir Putin addressing the Cabinet emergency session on Japan said that Russia is ready to come not to rescue but to help, and Dmitry Medvedev sent his condolences to Japan’s Prime Minister, Naoto Kan. But don’t you have a strong feeling that Japan will overcome? Ekaterina Kudashkina: To discuss the situation in Japan, we are now joined now is Tsutomu Ishiai of the Japanese newspaper Asahi Shimbun. There were some remarks by some Japanese government officials who saying that the world media coverage has produced a somewhat distorted impression of what is going on. Tsutomu Ishiai: I think about the foreign media coverage toward Japan focused on Japanese solidarity and cooperation, that kind of amazing Japanese behavior, but gradually the situation is getting worse. The Japanese government is trying to contain the nuclear power plant at Fukushima, but they are struggling. At the same time some radioactivity from the plant from Fukushima was detected in the center of Japan, in Tokyo. So people are afraid. I think the nature of the situation and the discussion is developing and changing. Ekaterina Kudashkina: What would Japan need from the international community, what kind of help, what kind of assistance? Tsutomu Ishiai: This is a very difficult question, but an important question as well, because in this disaster, the suffering will be prolonged. We have lost a big energy plant and the lack of energy will continue for some time. Lack of energy is a very serious issue as well as how to manage those issues – maybe we need to import more energy or we need to redirect pipelines from Russia. Also, the northern part of Japan is heavily affected, and its industrial operations have now stopped, so how to create new cooperation between Japanese industries is also important. Ekaterina Kudashkina: How might the Japanese disaster affect the nuclear power industry? We addressed this question to Malcolm Grimston, Associate Fellow in the Energy, Environment and Development Programme at Chatham House, London. Malcolm Grimston: First we need to see if there are any useful lessons to be learned. These are reactors from the 1960s and they have a design that was not widely used around the world. Modern nuclear power stations that use the forces of nature to cool themselves down rather than relying on pumps and the like probably won’t have any very great lessons to learn. I believe that the long-term argument for nuclear power hasn’t changed very much, but it is absolutely right that people ask questions. Ekaterina Kudashkina: There is a huge debate going on in the European Union over nuclear power; the government in Germany has already yielded to the public pressure to an extent. What is the general situation across other European countries? Malcolm Grimston: It varies very much, Germany has always had an anti-nuclear movement; in countries like France, the attitude to nuclear energy is much more positive. I do not believe that France will change its course because of this; in the United Kingdom the Energy Secretary has said that he would want us to look carefully before licensing a new plant, there was a statement saying that we do not wish to go ahead. So there are variations from country to country. And some countries like Austria and Ireland have never been particularly pro-nuclear. So there is a range depending on the individual circumstances. Ekaterina Kudashkina: I have been talking naturally to some people from Greenpeace and they were very passionately telling me about alternative energy sources, but how viable are those sources? Malcolm Grimston: As a world, we certainly need to use much more renewable energy than we are at present, because we can’t continue to use oil, coal and gas in the way we are. However, many renewables are not particularly reliable, they depend on whether the tide is up, or the sun is out, or the wind is blowing, and that means that makes it difficult to provide what is called base load power, using renewables. The base load is the big challenge in Japan at the moment. Had Japan been significantly dependent on off-shore wind or tidal power or light power, then the earthquake or the tsunami would have simply destroyed any energy sources of that nature. So there are no very easy answers. Ekaterina Kudashkina: What could be the future of the market for nuclear energy, even if we do not take into account the outcome of the Japanese tragedy, but rather how it has changed or strengthened a certain mindset? Malcolm Grimston: Well, we certainly have seen over the course of the last 10 years an enormous change in public perception of nuclear energy, and it has become much more popular. I think many people will be afraid of the outcome of this, whatever the outcome is, and will feel fear for some time. I do believe though that before very long we will go back to recognizing the need for energy outweighs the disadvantages of any energy source. Ekaterina Kudashkina: Now we are moving to our second heading – Between the Lines – in which we usually discuss what we see as one of the most notable publications of the week. This time I suggest we discuss “Is U.S. Aid in Afghanistan helping to win the War. Doubts are increasing,” by Anna Mulrine, published in the Christian Science Monitor. I think that the question itself – the way it is posed - implies several angles. Sergei Strokan: I know there are cases when aid becomes something like a double-edged sword, but I don’t think that could be the case in Afghanistan. The country has been torn by wars for roughly a quarter of a century. The question is: Could it do without any help? Mira Salganik: Let’s get closer to the subject. The story says that the aid money has not helped Afghanistan? Ekaterina Kudashkina: Well, not exactly. It says that some analysts – mind you, some defense analysts - are coming to the conclusion that development aid is not helping America win its war in Afghanistan. Mira Salganik: But the way I see it, the aid money was always seen as an important part of the American strategy in Afghanistan. Mira Salganik: Does anybody know how much have the Americans spent in Afghanistan after all? Ekaterina Kudashkina: The Christian Science Monitor would not quote the exact figure, but I discovered the latest data in a statement made by Sen. Kirsten Gillibrand. In one of her recent conference calls with reporters, she said that over the last decade, Americans have spent $336 billion on the war in Afghanistan. According to the latest UN report, published in February, in 2010, the number of civilians killed as a result of fighting in Afghanistan rose by 15 percent compared with the previous year. Insurgent attacks accounted for 75 percent of civilian deaths, which signified a 28 percent increase. Then, aside from the general increase in insurgent caused civilian deaths, there was a 105 percent increase in assassinations and an 83 percent increase in abductions during the 2010. It is appalling! Sergei Strokhan: Which means that security situation is deteriorating. How could aid money help in this situation? Ekaterina Kudashkina: Well, the story quotes a Mark Moyer, who is a former professor at Marine Corps University and a Pentagon adviser. Now he is a director of research at Orbis Operations, which is a consulting company specializing in stability operations. Mr. Moyer published a paper in which he maintains: “Development spending has done little to increase popular support for the government, casting doubt on the counterinsurgency and development theories that have inspired this spending”. Mira Salganik: The way I see it, courting the local elite is the best way to increase the corruption in the country. Ekaterina Kudashkina: I am pretty sure that the whole experience of the 19th and the 20th centuries supports your point of view. Moyer’s logic is that carefully selected elites can do more to help the U.S. military improve security in the country, because they have the ability to influence others. Sergei Strokan: I am not sure this approach would always work. Ekaterina Kudashkina: Well, neither am I, but besides I believe that Hamid Karzai is one of the country’s elite and he’s been always seen as a U.S. ally, and he was doing his best to provide support for the international coalition. But what he’s been saying recently sounds rather desperate, and angry, although in its essence it doesn’t contradict the US ultimate goal. Last Saturday he said: "I would like to ask NATO and the U.S. with honor and humbleness and not with arrogance to stop their operations in our land. We are very tolerant people but now our tolerance has run out." We can discuss this issue with Daniel Serwer of Johns Hopkins University School of Advanced International Studies in Washington, D.C.
Daniel Serwer: I do not think Mr. Karzai really wants NATO to leave immediately. What he wants is for them to stop killing Afghan civilians, and he wants them to leave eventually. But clearly there is a really divergence between what the Americans think is necessary to down the insurgency warfare, and what Karzai thinks is necessary, and that causes some real problems between Americans and the Afghans right now. Ekaterina Kudashkina: So what does Karzai think? Daniel Serwer: Karzai thinks that the operations are hitting civilians too frequently and that it should be done without night-time raids and such kind of things. The problem is that you know, it is easy for him to tell the Americans how to behave, what would he do if he were in charge of the war against the insurgency. Ekaterina Kudashkina: Do you think that what was happening in the Middle East now could have some repercussions in Afghanistan? Daniel Serwer: I haven’t seen any echoes of the Middle East reaching Afghanistan, but that doesn’t mean it couldn’t. I do think that what is happening in Japan has an impact on Afghanistan, because in the year when we were anticipating an economic recovery, what is happening in Japan is going to sharply raise oil prices and make recovery much more difficult. Americans have already been suffering very severe budget constraints, and the question is, if they become much more severe, will it impact on the war in Afghanistan. There is no question, it is a war that straining us in significant ways. Ekaterina Kudashkina: Now we shall turn to Man in the News, Red Line’s concluding heading. 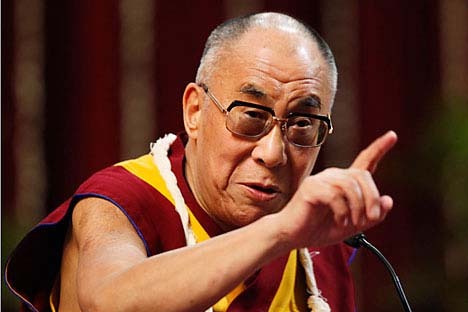 The man we are going to speak about this week is the Dalai Lama, Nobel Peace Prize Winner, world renown spiritual leader, seen by millions of Buddhists as living god, while denounced by China as a “wolf in monk’s robes” and threat to China’s territorial integrity. This time, the Dalai Lama hit the headlines by announcing his decision to step down as a political leader of Tibet and to devolve his power to a successor of his choice, most likely the head of Tibetan government-in-exile. Sergei Strokan: I have noticed that it is not easy for him to step down. Tibet's parliament-in-exile deliberations on the issue, held this week, turned into a highly emotional debate and many lawmakers were refusing to accept his resignation. Mira Salganik: This is not at all surprising, not at all. The 75-year-old Tibetan spiritual leader is a symbol of 60-year old movement for Tibet independence from China. Ekaterina Kudashkina: As far as I understand, his possible stepping down leaves the Tibet independence movement at a crossroads. But do you understand Dalai Lama’s real motives? Could it be that an old man was getting simply tired of struggle? Sergei Strokan: As I see it, the Dalai Lama feels that the Tibet resistance movement is in a deadlock, that it is losing its steam. He is quite pragmatic about it and has a good sense of reality, unlike many old theocratic leaders. So it seems that he is looking to rebrand the Tibet independence movement, enriching it with new leaders, new decision-making process, and maybe a new democratic spirit. Mira Salganik: What I would like to stress is that the Tibet’s spiritual leader is a highly dedicated man, so he probably feels that by democratizing the movement, he will steer Tibet's leadership in a direction that will make it difficult for the Chinese leadership to dominate in the dialogue after he is no longer around. Sergei Strokan: The other thing is that Tibet is regarded by Chinese government as a particularly sensitive point. Not only because of its geographical location, but mainly because of the Dalai Lama, who provides divinely sanctioned leadership to the Tibetan movement. Ekaterina Kudashkina: But the Dalai Lama never demanded Tibet’s independence from China, and even now he continues to advocate what he describes as a "meaningful autonomy" for Tibet. Mira Salganik: Let me add that it was the Dalai Lama that coined the term “cultural genocide” to describe the Chinese policy in Tibet, he never diverted the movement from the “middle-way,” the classical non-violent campaign, and he never demanded anything but autonomy from the Chinese state. Nevertheless, do you know how the Chinese government reacted to his announcement? Ekaterina Kudashkina: China denounced his resignation calling it a "trick,” and China insisted the Dalai Lama had no right to choose his successor, but must follow the historical and religious tradition of reincarnation. Mira Salganik: I think the Chinese government is taking a pragmatic approach to this rather exoteric issue trying to split Tibet’s resistance by Tibetan means. How do you see the recent statement by the Dalai Lama? Jothy Malhotra: One thing that the Dalai Lama has done since 1959 when he fled his homeland in Tibet and came to India is that he has been extremely open about what he wants to do. And what he wants is that the Tibetan people live in a free place, in a free region. I think what is also very interesting about the Dalai Lama is that over the last 23 years, since 1988, he has very, very clearly given up the option, or given up the demand if you like, of the independence for his homeland, Tibet. He said he would like Tibet to be part of China; he admires the Chinese people, saying that there are a lot of things the Tibetans can learn from the Chinese. But within the Tibetan autonomous region, there must be cultural and spiritual freedom. And I think that what he is trying to do with this latest step of his. He is in good health, but we all know that he is not immortal. One day he will have to die. And while he is alive and in good health, he wants to train leaders living in India to take over the Mantra from him. So, that’s why he is devolving political power - he keeps the spiritual mantras remaining the spiritual leader of the Tibetans worldwide, but he doesn’t want to be their political leader any more. Ekaterina Kudashkina: Is there any viable successor to the Dalai Lama as a political leader? Jothy Malhotra: There isn’t any viable successor as yet; there are three or four candidates who have to become the prime ministerial candidates or the political leader. And that is a very good sign in itself, which also shows us that the Tibetans are modernizing themselves. This is a very intelligent step on the part of the Dalai Lama, because what is also trying is to signal to the international community is that unlike what you believe or unlike what the international community believes about Tibetans—that they are poor people still living in the Middle Ages and they all are subservient to a spiritual leader or a both spiritual and political leader—they are in favor of becoming a modern community to be led by elected leaders. This is a signal to the international community, because in contrast, the People’s Republic of China, which is a very rich country, is not a free country and has no free and fair elections. The Tibetans are interested in modernizing themselves, they would like to be ruled and governed by an elected political leadership, whereas spiritual matters should be left to other people. So, this separation between politics and religion is happening for the first time in history of Tibetan affairs. And that I think is a very, very important step. Ekaterina Kudashkina: Do you think that Beijing could somehow ease its stance towards the Dalai Lama as soon as he steps down as a political leader? Jothy Malhotra: I don’t think so. If you know the Chinese - and I am sure you do - that is not in their nature to forgive and forget and to move on. I think that the Chinese are waiting for the Dalai Lama to die because they believe that once he dies it will be much easier to divide the Tibetans. And they believe that there will be nobody able to inherit that kind of leadership and influence which the Dalai Lama has today. But I think that the Chinese are wrong. When the Dalai Lama dies - and everyone will die one day including even him - he will have a second-rung trained leadership. And perhaps these people will be much more militant than the Dalai Lama is.